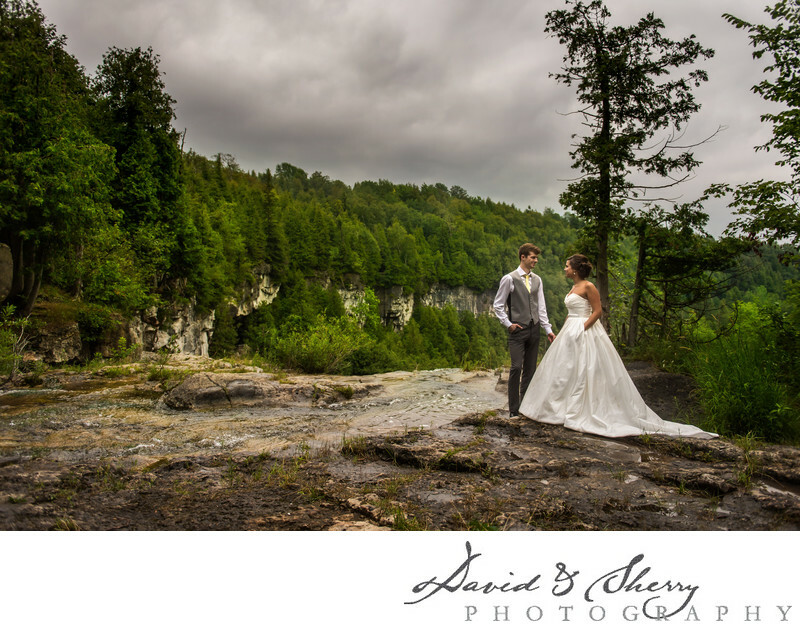 We were privileged during this wedding to travel to Eugenia Falls north of Thornbury, Ontario where we used the unique Niagara Escarpment landscape with the gently running river as a backdrop for our bride and groom in their wedding attire. These very Ontario nature like pictures provide our clients the natural view they were looking for with their wedding and demonstrates their love for one another. Interestingly the bride's wedding gown even has pockets in them which are shown in this picture as the bride and the groom both have their hands in their pockets which is sometimes seen as unusual. When we are presented with such a park or nature preserve we are conscious to capture some widely composed images in order to draw in the nature that surrounds the people and shows the context of where they are during this picture. Nearby cities to get married in are Markdale and Thornbury and though it takes a bit of a drive to arrive at this spot I believe it is worth it. It is best to wait until a park ranger isn't around so you can walk out into the water to get some very interesting and well lit photos.